The Rocky Slapshots is a club that practices every Thursday from 8-10pm in the small gym in the Fortin Education Center. If you want to have fun and learn how to play floor hockey then joining Rocky Slapshots is your chance. The founder of the Slapshots team is junior, Clifford Benner. Anyone who wants to play is welcome. Benner continues to put more effort into the club every year. Benner started the Slapshots in 2014. photo courtesy of Cliff Benner. 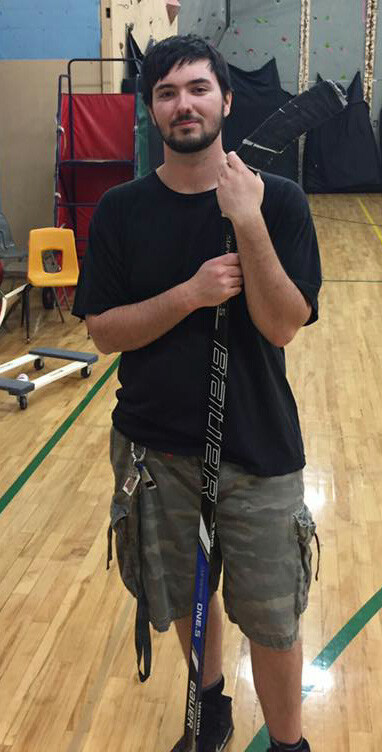 Benner played street hockey in his neighborhood before coming to Rocky Mountain College. After talking to a few of his friends about the idea of starting a hockey club on campus, he decided to do it. The club began in 2014. At first it started with 4 people who showed up for the first informational meeting, and at the first official floor hockey practice 6 players showed up. Benner was proud of what he had formed and though it can be hard sometimes, he sticks with it. The team is always having fun with fundraising. Sometimes it is as simple as running concessions at a volleyball or basketball game. Other times it is creating an event like the inflatable hockey tournament, which they just started this year. The inflatable hockey tournament was held a few weeks ago, and it was a lot of fun for everyone. It consisted of two-player teams and five-minute games. For some of the players, it was hard to control the ball with the inflatable sticks. Others found out how to do it right away and just irritated their opponents with the sticks because they knew they wouldn’t hit the ball. It was a fun way for both participants and members of the club to fundraise. The Slapshots pose after activity at the skatng rink. photo courtesy of Sydnee Hancock. Another task Benner achieves is making several activities possible for the club. One of these activities is going to the ice-skating rink in The Heights, where club members can proudly wear their jersey, learn how to skate and play real ice hockey. This year, the club went to the arena a couple weeks ago. It was fun for many of the players. Benner is always trying to get more hours on the ice. “That is a highlight, every time we get the time on the ice,” Slapshot member Noah Olaff said. The club encourages more people on campus to come and join their events such as the Tone Event that is coming up. It is the club’s annual video game hockey tournament. Benner says to contact him for more information on the club at clifford.benner@rocky.edu.